We live in an age of superheroes. Over the last decade, a number of superhero-themed movies have become blockbusters, old comic book heroes have regained popularity, and a fair number of superhero games have graced our computers. Originally released in 2004 on the PC, City of Heroes is a massive multiplayer online role-playing game (MMORPG) that takes the hero mythos and expands it into an expansive metropolitan world where you can fight crime, join a superhero team, and become the superhero you’ve always dreamed of being. The City of Heroes Mac edition not only comes with the original City of Heroes, but the devious sequel, City of Villains. Whether you choose to play as a good or bad guy, the two exciting games tap into the hero (or villain) in everyone. Comic book fans and those new to the genre will appreciate the customizability of the game. 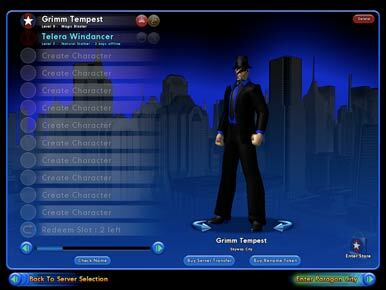 City of Heroes has one of the best character creation systems this side of Spore ( ). You not only pick the character’s appearance, but their primary and secondary abilities, origin, and name. I easily set up my debonair magician with a sleek zoot suit and ice powers, and then hopped over to the villain side and set up an elven ninja assassin. After setting up your character, you’ll be transported to a city to learn how to use the many features of the game and meet your first contact, who will give you missions. Throughout the game, you’ll find scientists, police officers, radio scanners, and other do-gooders who need your help to stop crime. If you choose to play as a villain, you’ll start off in jail and have to prove your worth to some of your more powerful cellmates before you break out. You’ll then find yourself employed by an evil army reminiscent of Cobra from the G.I. Joe cartoons. Hero or villain, you’ll have plenty of missions where you’re sent to a specific location to beat up a number of gang members. There are numerous classes (some classes are locked at the beginning of the game and can only be unlocked after a certain level of achievement) and different combat styles from which to choose. If you don’t like how your powers developed, there are tokens you can purchase to not only reassign powers but rename your character. The gangs frequent different parts of town, and as you advance, you’ll always be confronted with similarly matched (and superpowered) enemies. Players can roam all over the cities right off the bat, but some areas are either sectioned off for advanced players or not easily accessed simply on foot. As you advance, you’ll learn new skills to make transportation faster, teleportation and flight being two of my favorites. While there is mass transit available by rail, I still found myself running around for the first few hours of gameplay and therefore constantly harassed by gang members on the street. And if you’re dumb enough to wander into an unexplored map where you’re not receiving missions yet, you’ll be confronted with many hoodlums who have superior powers to you and can destroy you easily. Until you reach level 10, you’ll receive no penalty when dying. You’ll be knocked out and can either wait for a friend to revive you or you’ll be transported to the local hospital. You reach higher levels through successful completion of missions and defeating bad guys (especially those of equal or higher level to you). Each level gained gives you access to new powers and the ability to augment your current powers with Enhancements. Enhancements can also be purchased and taken off defeated foes, and can do everything from making your fire blasts more damaging to upgrading your defense against disorienting attacks. Short-term upgrades, called Inspirations also help augment your powers. There are also merit awards for accomplishing certain goals, salvage elements to discover and combine, and other loot to find in the world. Aside from the initial contacts you’re introduced to in the game, you can gain access to different factions and agencies. You’ll also discover supergroups, teams, and the ability to become a sidekick or gain a sidekick with a fellow player. One of the greatest thrills in the game is assembling a team of friends to bust into a villain’s hideout, chock full of cliché-spitting goons. For those players who have the time, there are Task Force and Trial missions that must be completed in one sitting and with the same players. Granted, the hideouts are all pretty sparse inside and are pretty formulaic in their layout and pacing. The game is a few years old, and you really see the dated graphics and models in the warehouses and sewers you’ll find yourself. For those who want to play not with their friends but against them, there are also four player versus player zones. You need to be at least level 15 before you enter any of them, and your character level is either temporarily raised or lowered to fit the level’s guidelines. The cityscapes are massive but aside from seeing the funny comments of some gang members, there isn’t much to see. The non-player characters (NPCs) you encounter on the street will either be guides, civilians, or goons. You’ll enjoy saving a woman from her muggers the first ten times you do it, but when you realize the street is literally overflowing with these kinds of crimes, you’ll become oddly indifferent about such violence on the street as you run past to your next mission. The potential for heroism is only partially realized in City of Heroes. After you beat up enough hoodlums, you realize the mission variety is remarkably thin. Sure, you can leap tall buildings with flight, outrun a speeding bullet, and do all kinds of other geeky superhero stuff, but you’ll still find something lacking. You can’t rescue people from burning buildings, save kittens from trees, or outwit your foes. You fight on the street, with your friends, or in a hideout, but for the first dozen or so levels the formula is pretty consistent with some limited exceptions (bank rob missions and find the artifact missions, for example). I found the villain side more compelling because I got tired of saving Paragon City and wanted to spend some time destroying it. City of Heroes isn’t the perfect MMO—the mission variety leaves something to be desired, the city itself lacks depth and the graphics are dated—but it’s probably the most complete superhero simulator I’ve played. Whether you want to save the world or build an empire of crime, you’ll have plenty of cosmetic choices in appearance, abilities to choose from, and many hours of team-based combat to look forward to. It’s never been easier to feel like part of a Justice League- or X-Men-like superhero team or to feel nostalgic about great moments in comic books. Despite its flaws, City of Heroes nearly lives up to its superhuman potential.